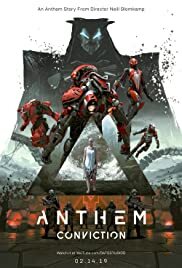 A live-action story of survival set in the world of Anthem (2019), decades before the events of the game. Seems to be in a post apocalyptic world: a weary woman find shelters , where she is faced by excruciating but soothing situations. 2 scientists develop a weapon. They can control a human's neural activation by this weapon. Scientists try this weapon on a prisoner.